We have been using up the beef in our freezer to prepare for our next butcher day coming up in mid-September. This month Pete suggested that we try making jerky. We used a kit and made it in our dehydrator from the last of our rump steak. It came out really nice and I ate most of it. Now I'm looking forward to having more rump and trying some new recipes! Preparing for butcher day involves digging a hole for the waste, making sure we have enough plastic freezer bags (to bag 300 kg of meat), cleaning out the freezer, and often buying some new equipment. This year Pete spotted a heavy duty mincer on special, and here it is, ready for mincing. I wasn't sure what to write in this section, I think we reduce so much I don't really notice it anymore! But I did want to tell you about our chickens. We killed three roosters a few weeks ago, and used one of them to make roast chicken and stock, and froze the other two for later. We get about 8-9 eggs from our 20 hens at the moment. I suppose you could say that the "reduce" here is that we never buy chicken meat, eggs, or stock, because we produce all of that for ourselves. The rain did my garden good, I wrote about my garden on Monday here. Also on the subject of grow, we have finally accepted that Bella the house cow is not pregnant. She should have had a calf by now! She is currently looking quite fat. Not in a pregnant way though. Cows always have big fat bellies, and when they are pregnant, they have a bulge to the right-hand side as well. A fat cow has fat on her ribs, a skinny cow has ribs showing. Bella is looking in lovely condition, but very symmetrical and not at all pregnant. Molly is looking pregnant though, so one out of two at least. We are having a lot of trouble figuring out when Bella is on heat, so we are thinking about getting an expert in.... we have found a little bull who might be able to help us out. Back on to chickens, I've started a chicken tractor ebook. I've designed the cover and written a chapter outline. I'm hoping it doesn't take as long to write as "Our Experience with House Cows"! 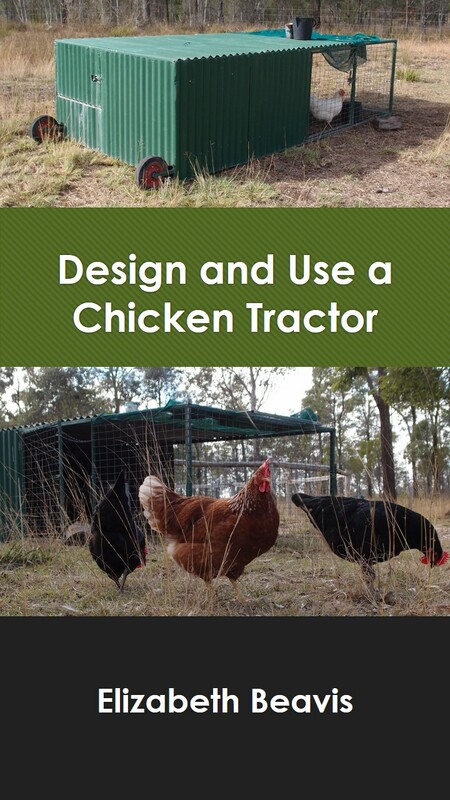 If you use chicken tractors I'd love to hear from you and feature you in the ebook. Also, if you have any chicken tractor questions, let me know so I can make sure I cover everything. And I made my first ever crochet squares! I sorted out all my seeds and worked out what I have in excess to swap, I'll post my seed swaps next Monday. I love saving and swapping seeds, its a massive saving and I encourage everyone to try to save seeds too. You can never read all the house cow books.... here's another one, it has wonderful photos, I think its going to be a great resource for new house cow owners and I've learnt a few things too. Another house cow book to read! We went up to the beach for the weekend. It was too cold for swimming, but great for playing ball, and a nice break catching up with family. How was your August? What's coming up in September? Join in with Slow Living Monthly Nine, its fun!